In addition to the fantastic interview of Atlas Games' Keith Baker, done by Board Game Geek at Gen Con 2015 in the video below, we decided to do our own questioning. Furthermore we snagged a question from our Twitter followers! Below is our Q&A with Keith Baker, Munchkin Gloom Game Designer, and Michelle Nephew, Tenured Editor, from Atlas Games. How did this come to be? When did someone say lets put these two games together and see what happens?! Keith Baker: Michelle knows what went on between Steve Jackson Games and Atlas Games. When the idea was first presented to me, it was a matter of does this make sense? The basic principle of Gloom is that you are telling a story about a group of characters, and you want them to suffer and die. In Munchkin, you want your character to triumph; where was the bridge with Gloom? Initially I worked with the idea that you would play the monsters in the Munchkin dungeon. After all, in order for a Munchkin to rise to the top, many many innocent monsters have to die. However, I found that there wasn't a lot of depth of story with this. Everybody laughs when they see the Wraith of Khan, but you don't want to actually spend an hour telling his tragic story. Then I realized that Munchkin Gloom wanted to be about the losers of the game - all the adventurers who go into the dungeon but don't succeed. Anyone who's ever played an RPG has stories of the time they Fatally Fumbled, or Triggered a Trap, or for that matter Dated the DM. In Munchkin Gloom you're telling the story of the worst dungeon delve every - the adventure in which everything that can go wrong will. Michelle Nephew: Basically, we met up at a tavern and decided to go adventuring together! Seriously, though, the Atlas Games crew and I were having dinner with Phil Reed and Steve Jackson at the Munchkin Tavern at Gen Con. John Nephew and I had the idea for Fairytale Gloom in our heads, and were thinking about other Gloom tie-ins when the "you've got your chocolate in my peanut butter!" moment happened. We've cooperated with Steve Jackson Games in other things as far back as the mid-90s, so the chance to do a new project together appealed to all of us. Where did the inspiration come for the design on this game? Keith Baker: I didn't want to add a lot of new rules or complication to the game, but I also wanted to find SOMETHING that would help define it as Munchkin Gloom. Mechanically, there's two elements. One of the critical things that defines Munchkin is backstabbing your friends. Gloom isn't designed with this sort of interactive treachery in mind. I compensated for this by shifting a lot of traditional Gloom effects to hurt other players . . . so an effect that would be "Draw 2 cards" in traditional Gloom is "Draw 2 cards from the hand of the player to your right" in Munchkin Gloom. The other effect is Events that are automatically triggered when you draw them, which is a way to bring in some of the chaos of curses from classic Munchkin. Michelle Nephew: In terms of graphic design we wanted something that preserved a Gloom-y feel while blending it with John Kovalic's Munchkin styling. I think John hit just the right tone. What was your favorite part of working on Munchkin Gloom? Keith Baker: Usually I'm restraining my love of puns; for Munchkin Gloom I had to push it to my limits! Beyond that, it was fun to think about everything that could go wrong in a traditional adventure . . . and also to think about my favorite elements of Munchkin. For example, I love the character Ted, the Super-Munchkin; "He's a Noble Half-Vampire Half-Werewolf Eagle Knight Elite Wizard-Ninja Pathfinder with a French Accent." I wanted to come up with the most ridiculous character you could possibly make with all the sets at your disposal. Question from @darthbaldy on Twitter: 1st, love the game! 2nd, are Spyke, Flower, etc. in the game? Keith Baker: No, we decided to come up with a unique cast of characters for Munchkin Gloom. But you may notice a few familiar faces that John snuck into the Event cards . 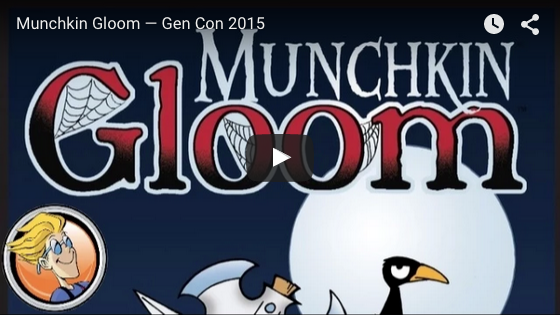 . .
Munchkin Gloom is available now at your favorite local retailer. If you don't have an FLGS you can order Munchkin Gloom today at W23.Thank you @darthbaldy and everyone who participated on Twitter for your questions!